Beautiful Nights is going back to Cali. 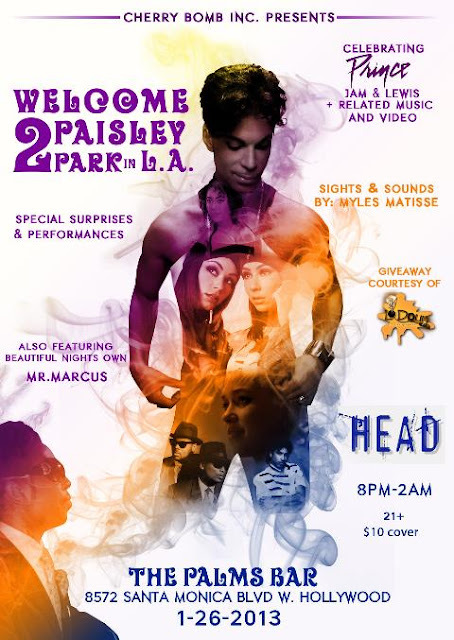 Marcus Scott, of the Beautiful Nights Facebook Page and Prince parties, based in Chicago, is headed to Southern California next week to assist with "Welcome 2 Paisley Park in LA," a HEAD party hosted by Myles Gullette, better known as DJ Myles Matisse, at 9 p.m. Jan. 26, at the Palms Bar, 8572 Santa Monica Blvd., West Hollywood. This is a 21 and over event and there is a $10 cover charge. The night will include music and videos by Prince, Jimmy Jam and Terry Lewis and associated artists and there will be several giveaways courtesy of internet radio station lodoun247.com, which specializes in hip hop and R&B. Matisse also said he will decorate the space "from floor to ceiling" with Prince and Minneapolis Sound-related album covers, photos and his own original paintings which will give the club a visual flair that is missing from many other Prince parties. There will also be a "Princely" drink menu, where the cocktails will be named after songs from the night's featured artists. 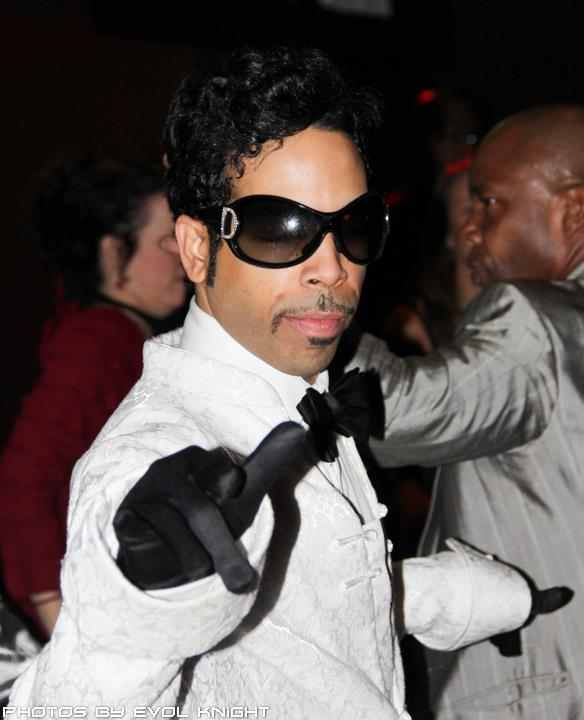 Partygoers will also get to see some very special surprise guests connected to the world of Prince, he added. "Just expect the best, most complete experience that you've ever had at a Prince party," he said. "One full of funk and the Minneapolis sound. Expect to have your senses rocked in every way." Matisse, the self-described "producer/host/dj/vj/designer" of the HEAD Prince parties has hosted between 15 and 20 events at the Palms Bar since 2008. Maneca Lightner, best known as the model on three album covers for Prince's jazz-based Madhouse project, even hosted one of the parties. However, the parties have had modest turnouts-- about 75 people attended to the party Lightner hosted -- and approximately 25 people went to the last party in December 2011. He said the LA Prince fans are a tight-knit group and that the word of mouth on his parties rarely spreads outside this community. He tried other methods -- such as handing out approximately 400 flyers outside the Los Angeles Forum during Prince's last stint there in 2011-- but, attendance did not significantly increase. Tamiko Umoren, originally from Chicago and now an LA resident, is an acquaintance of Matisse and Scott's friend. She was the one who first suggested bringing the two of them together to help increase attendance at the HEAD parties. She said she got the idea after attending the first Beautiful Nights party last November in Chicago and Purple Funk SF's New Year's Eve party in San Francisco a little more than a month later. After seeing the crowd's response whenever Scott walked into a room, she approached him at the party in San Francisco to see if he would want to work on future HEAD party. He said he would. She sent Matisse a Facebook message to gauge his interest and he also agreed. Scott, in turn, got in touch with him to discuss helping with promotion,-- including increased advertising on the Beautiful Nights and Purple Funk SF Facebook pages-- and bringing in special guests. The collaboration quickly grew from there. "I figured it's gonna be a perfect match. Why not give it a shot?" Umoren, who has been a Prince fan since she was 7 years old, said. "(Scott) and (Matisse) made it happen. Needless to say, on (January) 26, I think we're going to turn it out." However, Scott said he wanted to make it clear that he was brought in to assist and that he will not "take over" the night's events. He even compared their team effort to a Chicago Bulls combination of the 1990s: with Matisse being Michael Jordan to Scott's Scottie Pippen. He added that there have already been results from the increased promotion: there will be people coming in from Chicago, the San Francisco Bay Area and other places just to attend the party. "It's already getting a lot of buzz and I'm just doing my part," Scott said. "It'll leave room from a lot of great parties in the future." Matisse, originally from Kentucky, said he heard Prince for the first time in 1981, while he was attending a baptist private school, and he has been a DJ since 1984. He attended Eastern Kentucky University, where he hosted a campus radio show devoted mostly to Prince and associated artists, before dropping out a year and a half later to join the Army. In 1986 he began to DJ at military clubs and civilian bars. During his stint in the military he moved to Germany and began DJ work there in 1988. He later moved back to the United States where he spent some time in Texas, before attending Southern Illinois University in Carbondale, Ill. to study theater (with a minor in film studies) in the early 1990s. While there, he also produced 10 episodes of "The Max,"--named after Prince's 1992 song-- for the campus TV station that featured music videos and, again, was largely dedicated to Prince and associated artists. "I don't know any other artist who has such a passion for music and has such a large musical family that he has touched," Matisse said. He said he moved to California in 1995 to pursue work in acting, film production, writing and as a DJ. Once there, he was able to secure work filiming concerts and live comedy shows. He said he became inspired to start the HEAD parties a few years later after he went to events that claimed to be "Prince parties," but, by the end of the night would be playing songs by completely unrelated artists. He said he wanted to create a place for himself and other fans that "sticks 100 percent with Prince, (Jimmy) Jam and (Terry) Lewis and related music" and he also wanted to appeal to the dedicated fans by playing concert footage and unreleased songs at the parties. Matisse said that now with the collaboration of HEAD and Beautiful Nights he hopes he gets the chance to share his vision with even more people: old fans, new fans and people who may have "forgotten" about the Minneapolis Sound. "Just expect to have a beautiful night, a wonderful night, a Princely night," he said. "Ultimately, it's a night that would make Prince or anybody (associated with) the Minneapolis Sound happy." Tickets will only be available at the door. Also, all guests will receive one raffle ticket for the night's giveaways at entry and additional raffle tickets will be available for $1.00 each. Lead photo courtesy of Marcus Scott. Thanks to share information about Life o' the Party: Beautiful Nights Goes 2 Hollywood . Can anyone suggest me best nightclub nyc ? I want to go with my girl friend at some good place and the place should me safe and near to my locality.